I first tasted the delicious flavours of chermoula in a sea side town in Morocco. The restaurant I dined in served a fish tagine that was laden with the zesty, herb flavoured marinade. I loved it. When I returned home, I was obsessed with making chermoula. I began preserving my own lemons and whizzing up a batch of this North African marinade each time guests were coming for dinner. Back then, I often cooked vegetables with chermoula . I’d combine root vegetables – swede, carrot, turnip – with capsicum and chickpeas and toss the whole lot with chermoula. They would then simmer gently in a tagine with a little vegetable stock. 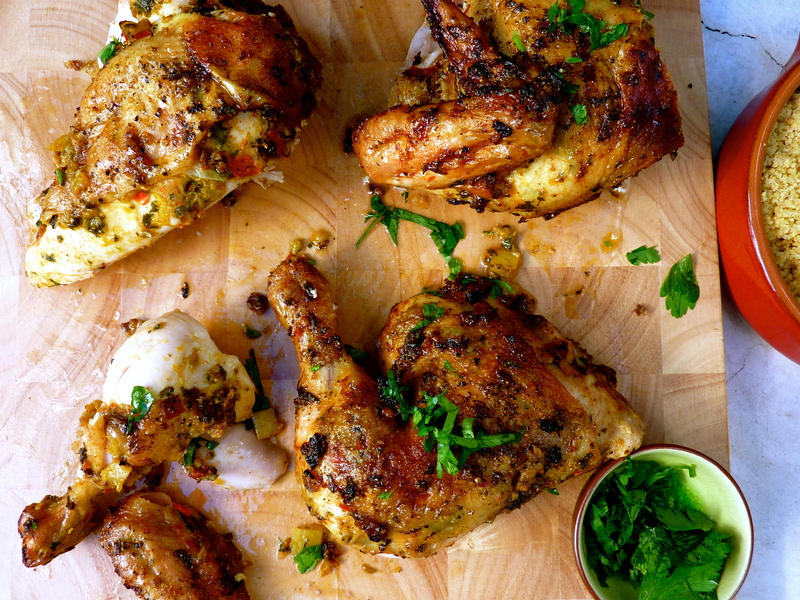 The all-important ingredient for chermoula is preserved lemons. They are dead simple to preserve yourself, click HERE for the recipe. You can buy preserved lemons, and for some that might be preferred. But they tend to be expensive for a meagre amount. The jar I stuffed with lemons and set aside to preserve a few weeks back are ready to use. Once you have your preserved lemons, the paste is straight forward – garlic, chilli, parsley, coriander stem, cumin, smoked paprika, saffron, and oil. I like to use a mortar and pestle to make my paste, i find it therapeutic, but for the time-poor, a food processor is quick and easy. I use the Portuguese technique for roasting my chicken – cut it down the back bone and roast it flat. A sharp pair of kitchen scissors will do the job, yet if this sounds too hard, ask your butcher to do it for you. Cooking the chicken this way keeps the breast moist and succulent. 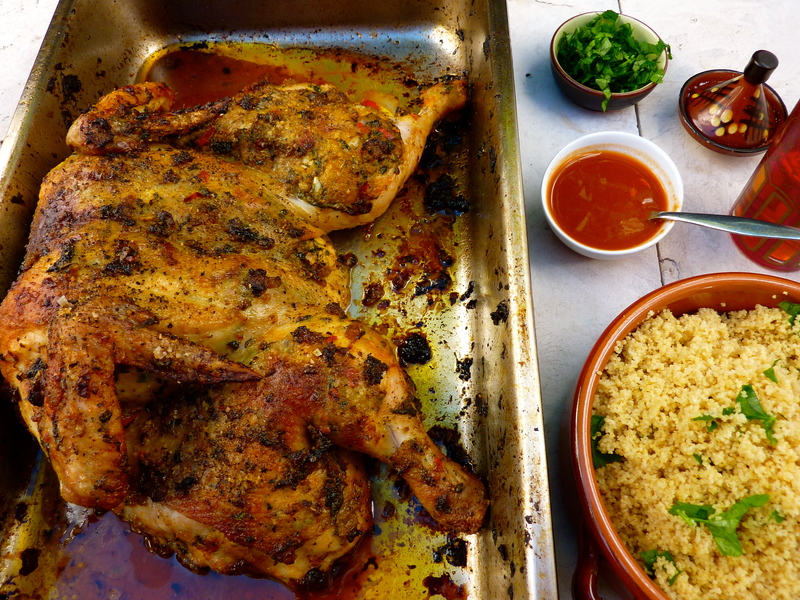 Once the chicken is coated with chermoula, under the skin and on top, the marinade needs time to work its magic. I recommend marinating over night, but if you really can’t wait, or have left the menu planning to the last minute, 4 hours marinating will be sufficient. The juices from the tray make an excellent sauce, and a bowl of couscous is the perfect accompaniment. Place saffron in a small bowl with 1 tbsp boiling water, set aside to soak for 5 minutes. Cut the preserved lemon in quarters; use a sharp knife to cut away the pulp and white pith, discard. Slice the rind into a rough dice. 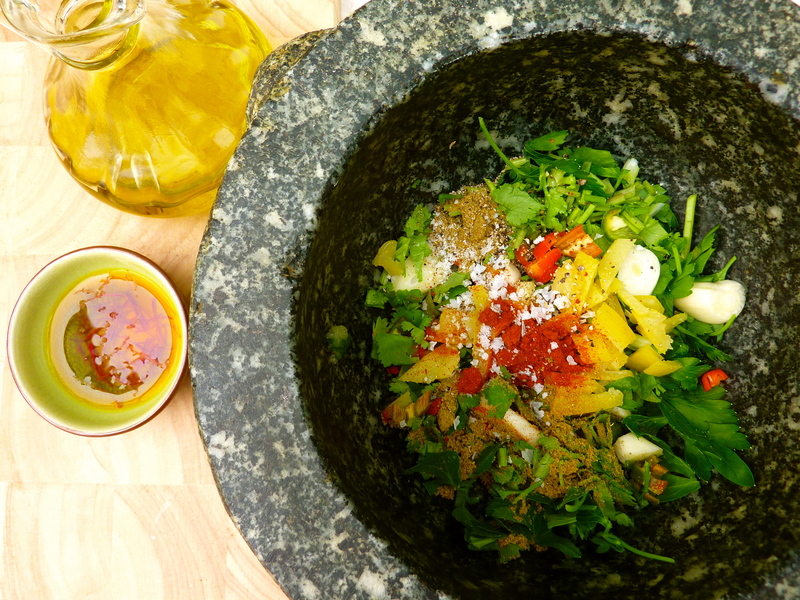 Place all ingredients for chermoula except saffron and oil into a mortar and pestle, pound and grind till mix resembles a paste (about 5 minutes) – there will still be some chunks of preserved lemon. If using a food processor blitz till well combined. Add saffron soaked water and oil, and stir till combined. Cut the chicken down the back bone using a sharp pair of kitchen scissors and press firmly on the back to flatten the chook, or ask your butcher to do this. Lay the cut rounds of fresh lemon in a baking tray and place the chicken, skin side up, on top of the lemons. Place your fingers under the skin of the chicken taking care not to rip the skin. Create a pocket between the flesh and the skin by gently separating the skin from the flesh. Do this on the leg pieces as well. Take half the marinade and rub it under the skin, smoother as much of the flesh with the marinade as you can. Take the remaining marinade and rub the out side of the chicken. Marinate overnight, or if you’re in a hurry for at least 4 hours. Pre heat oven to 200C, or 180C fan forced. Roast chicken for 1 hour, baste with juices half way through. Remove from oven and set aside for 10 minutes before cutting chicken into pieces. Skim the fat off the juices left in the cooking pan and spoon the juices over chicken. 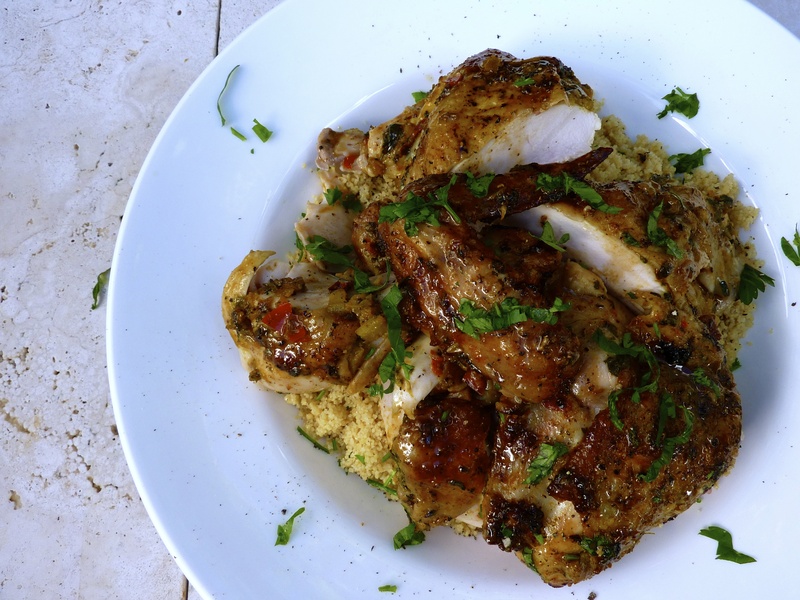 Serve with couscous and chopped fresh parsley. Place cous cous in a medium bowl, drizzle with extra virgin olive oil and season with salt and pepper. Cover with boiling stock, stir, and stand for 5 minutes. Fluff with a fork before serving. Marvellous. I am going to i=make it my mission to cook one of your recipes for you! Probably when I get back from overseas! Great stuff.